I lost a lot of steam at the end of 7th edition. My last real update was probably something announcing that I still yet lived! Or maybe pictures from a battle report back around the first of the year. Either way, I'm super excited for 8th edition. I have my hard copy of the rules and all the other book on digits....until the book with the Orks in it comes in at the shop. I ordered just behind a load of others and I think the Sunday prior to the release. But it's been ordered. As some of you may know the B&C opened up a forum for the Xenos armies. I've already launched a thread there. 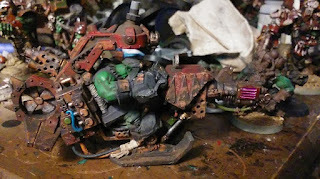 It's a guilty pleasure to openly post about Orks on the B&C. 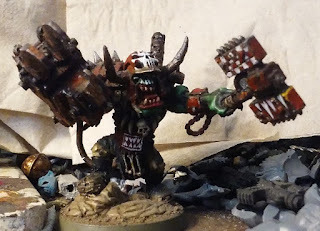 It's his WAAAGH! so he's the first picture. Deff Boss! Now with Big Choppa. WIP Deff Kopts with Kustom Mega Blaster! 1 of 3. 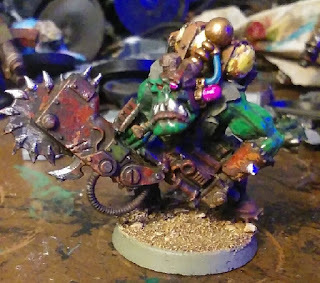 I made one more Old Burna boy into another Kill Saw Mek. I'm not really sure what I'm going to do with them. But the look cool. I have some posed the other way. But I'm not sure yet if they'll work for this "conversion' or not. I linked this from the B&C. Let me know if the picture doesn't show. That second killsaw mek looks almost like he's painted a Khorne rune on his helmet. Sawing all those gitz up Must've had an effect. BLUD FOR DA BLUD GORK! I nearly went that route. I'm kinda going the old 2nd edition look, where Goffs use a lot of red, not just black. I remember Khorne Orks back then. Yep, the old Freebooterz stormboyz of Khorne. What a book of Orky goodness that was. Fancy new Attack Squig for GorGak! I'm working on a lot of Gun Krews. 60 little grot gunners... So many...... 7 skin base coats to go. I've hit a early stopping point on the Krews they're not finished yet but I've set them aside. My group has had a little infighting over the last week but I think some good has come from that. I went up to play last Saturday and arrived an hour behind schedule I nearly called off but I really wanted to go so I figured the drive was worth it. And after arriving we didn't get started for about another hour. So things may finally be coming together on all of that. Which is nice. The 40K game was Madness a 4 turn, 4 player free for all! which the Orks "easily" won. haha. Truthfully the Orks nearly crushed the scores of all three of the other players but I was not keeping score and just on a rampage. We all had a really good time. I'm thinking I'd like more Kannons. I have three but I kinda wish I had more. maybe 6, 12 or 18 of them. I have no idea if I'll be able to do that. Today I've started to paint 4 KMB's for either my Deff Dreads or Killa Kans. or, maybe for future killa Kans. I have parts set aside to adapt these to my old Metal Killa Kans. but I've not put the time into getting that done. It'd be cheaper than buying more killa Kans so I'll likely do that. I've painted another Attack Squig(Pictures later) and am working on another one! I'm kinda just doing a bunch of small projects for fun right now. Picture in a few days! The better part of 30 grots I've been working on. Have to Dot the eye's and give them some kind of a swash still. I'm waiting to base them as I plan to rebase the entire collection. I have 10 more of this sculpt and though I had another 10 on the sprue but can't find those. though I might have more of these but haven't found them. for some reason I recall having 120 grots. but so far I'm not really sure that's correct. I may have found more Kannons to buy maybe. We'll see how that goes. I'm opting to add 3 more to bring my total up to 6. That seems reasonable. I my have new AoS models to paint in a few weeks I'm watching an auction now. I'd love to win it but we'll see. I've been working on small projects for a while now and it's getting things accomplished so I expect to do more of that. Having a game on Thursday with my usual Scrumgrod, he's on vacation for a few days over his Birthday so I may have to get him something. Probably something power armoured. After having it "easy" WAAAAGH GorGak has encountered the fish'ead. Beware the fishead's. Looks like I need to ramp up the power in my lists a bit to have a better fighting chance against them. Beakies are easy fishead's not so much. After the game I spent some store credit I have been saving up and brought home Boss Snikrot and the makings of another Weirdboy. Small projects has been good for me, getting a little bit done here and there. I Still have to get pictures. Shooting for the end of this month. I'll also have some new AoS Bonesplitters painted by then. The tribe is nearly finished. 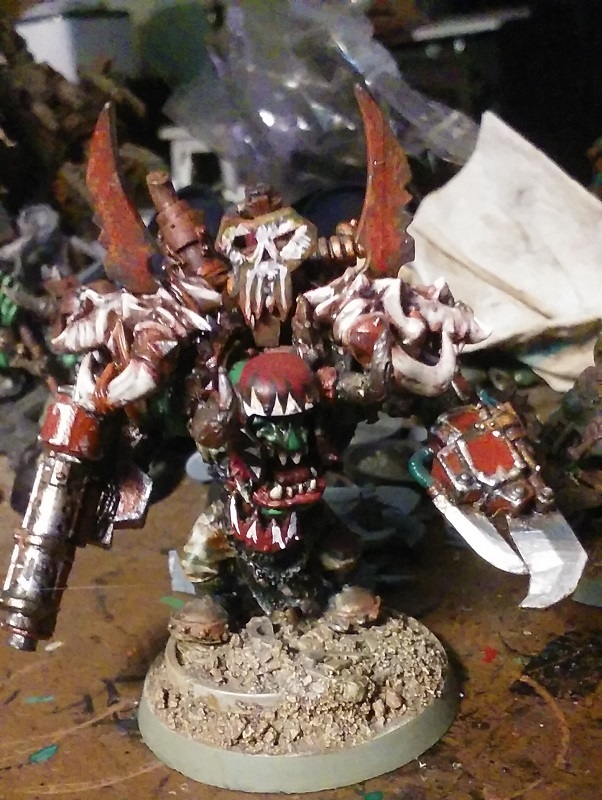 The Grots tell me of a bitz trade Monday. WAAAAGH GorGak has plans for a fight with some numarines and there will be loot and a small trade. My friend tells me he has an unopened box of flashgitz. Sounds good to me! I'll be taking a Gorka Morka themed list with some mobs in trukks and some on foot. I need to start working on the army list I will be taking to the club tournament in October. I have some Fishead's to wreck up with it to get it ready. Mondays list will, I hope, set me going in the right direction for that. Which means it will make me put an army list on paper... I have no idea what we're doing on Monday. Points? Power Levels? It is a mystery. I do know to expect a Land Raider, it's part of the bitz trade. No 40K minis on the table right now. I'm nearly done with 10 Pig boys for my tribe. And have more work to do on my latest spell chucker. And some time next week a few more tribesmen (Can I call savage orks in a tribe tribesmen? 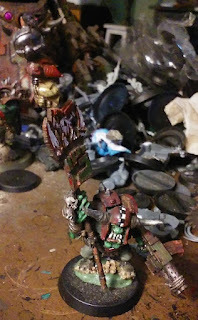 Well, we're orks and we loot so we'll appropriate the term for now.. ) arrive from ebay land. I see 3 more Big gunz in the future... Kannons and krew... They're coming. Good game with a few small high points for the Orks and a learning experience for my friend. No Progress , Just waiting for Hurricane Irma to do it's thing. Dunk. Planning to work on ml bonesplitterz over the week end. After a long day scavenging for fuel, driving over 100 miles to get the job done, I find myself thinking about GorGak as a Savage Bigboss for my Bonesplitterz. So, with an extra Savage Big boss as a place to start...GorGak goes AoS. he'll, I hope, have his distinctive Skull shoulder plats with spikes and instead of a Klaw he should have a really big sword. I may be making that from plasticard and green stuff.And instead of a helmet maybe a crown of horns. Something cool. Haha Thanks. We just got our power back after 5 days, something like that. I had hoped to change the pose just a bit more but the model only lets me do so much. I've given up on the Shoulder plates and Crown of horns for the big toothy gob. The sword is bade from 2 stone choppas, a bone bit used as a drum stick and some extra horns from some hand weapons. it's pined together with a plastic arrow. I covered the joints in liquid green stuff to help keep it together along with the glue. I'm working on some models for the B&C's Xenos painting thing. I listed 18 grot, 5 Storm boys and 5 Flash Gitz. It's turned into 28 Grots 3 Kannons 5 Flash Gitz and a bunch more storm boys. But I'm not going to adjust my entries I'm just going to dump pictures of painted models on them. But it doesn't end until January. I'll have some pictures to share here soon. I was talking with some friends about rebasing my army 2 weeks ago and it seems I will be attempting to match the bases I did for my deff dreads for my entire army. some kind of scrap yard bases. Looks like I have 2018 planed out for me already... It's a nice idea and hopefully I'll pull it off.